Last December, I remarked that there were no casual applications for planeswalkers. My reasoning was that they were too strong for the fun room. Shortly after, I began playing in the Holiday Cube, only to realize that it actually was sort of fun to play with these cards, and I kind of wanted to do more of it. The problem remained that they are (generally) too powerful for most casual environments, as evidenced by all of the "no planeswalkers" you see in people's game descriptions. But I think I found a way to weaken them enough to make them fun again. You already know what it is, if you saw the article's title—a full deck of nothing except for mana and planeswalkers! Has this ever been done before? I spent almost ten minutes Googling and couldn't find any. I also asked around on some message boards and turned up nothing. So, like Toni Morrison once said, "If there's a book that you want to read, but it hasn't been written yet, then you must write it." Tibalt, the Fiend-Blooded RR: NO! This does nothing to improve our hand, and we don't want his other abilities that much either. Domri Rade 1RG: NO! 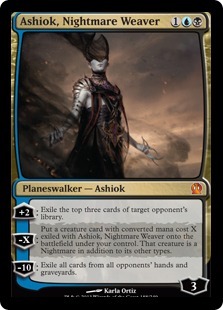 His +1 (draw a creature) will literally never trigger, and his -2 (fight) could only work off of tokens from other planeswalkers. 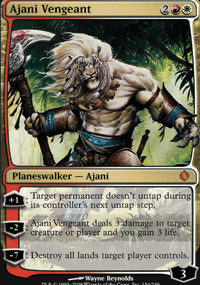 Ajani, Caller of the Pride 1WW: NO! The first two abilities would work on tokens only. Chandra, the Firebrand 3R: NO! The other 4-mana Chandra has a better +1 ability, and her -2 (copy an instant or sorcery) can never work here. Nissa Revane 2GG: NO! We can't tutor for a Nissa's Chosen and won't have elves to gain life from. Sarkhan Vol 2RG: NO! The +1 (pump your creatures) does little and so does the -2 (Threaten). This is about a Tibalt power level in this type of deck. Tezzeret, Agent of Bolas 2UB: NO! This guy is a powerhouse in the right deck... but this artifact-less deck is far from the right deck. Tezzeret the Seeker 3UU: NO! Same reasons. Garruk, Caller of Beasts 4GG: NO! None of the three abilities do a thing in here. This leaves us with... 32 planeswalkers to pick from. Seeing as we could make a deck with as few as 8 playsets (that's 32 cards + 4 mana producers + 24 lands), this actually gives us a lot of freedom. So I'm going to make two different decks: one midrange aggro and one defensive milling. Taking out a few mill-specific cards and then sorting into categories, we're left with this. I put utility on the top-left (draw, discard, etc), creature-producers on the top-right, and removal on the bottom. Of course some cards, like Garruk Relentless, do multiple jobs at once. If you can afford a deck of all planeswalkers, I'm assuming you can afford good dual lands as well, so my card choices from the above will take a best-of approach without any regard for color lines. In making creatures, we have nine options to choose from. Elspeth, Knight-Errant is out, because she's four mana and makes measly 1/1s. Compare that to the other four-mana options and you'll see it's by far the worst. Koth of the Hammer is out because he's too mountain-specific, and although we could get a few Taigas and Volcanic Islands and whatnot out, he just won't be pulling his weight. I love all three (remaining) Garruks, but we don't want to gum up the board with uncastable planeswalkers, so we have to make the tough call of cutting the 2GGG one. 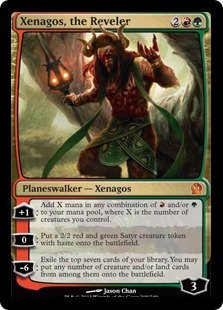 Xenagos, the Reveler is nice but we already have 2/2s covered by the 3G Garruk, and his mana ability is just a worse version of the 2GG Garruk's. He does have one use, though, which is variety. We can't cast two Garruks at once but we can cast one of him next to a Garruk. So we're down to those three token producers plus Sorin, Lord of Innistrad, Elspeth Tirel, and Elspeth, Sun's Champion. Let's wait until we see more of the deck before we start fine-tuning their numbers. 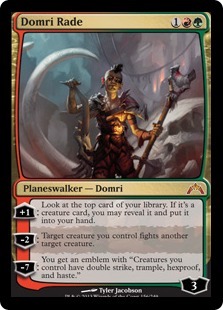 For the removal planeswalkers, let's take out Chandra, Pyromaster (first abilities are all obsoleted by other planeswalkers of ours), Sorin Markov (a little pricey), Chandra Ablaze (we don't want to discard what few red cards we have), and Nicol Bolas, Planeswalker (also a little pricey). For utility, let's cut Venser, the Soujourner—his flicker ability is a neat way to reset low-loyalty planeswalkers, but that's about all he can do for us. Sarkhan the Mad is a little redundant, so let's cut him as well. This brings us down to only 18 planeswalkers to pick from. We don't want too many playsets, since these are legendary(ish), so we actually have room for all of these. I think we're far enough in to start picking the numbers of each! Here's what I came up with, sorted by the mana curve. There are 31 cards, leaving room for 7 Rampant Growths and 22 land. As for why we want so many Rampant Growths, notice the preponderance of 4-drops and the dearth of 1- through 3-drops. Here is what I eventually settled on. Obviously this is meant to be extremely casual and I encourage you to tinker with its contents. Not recommended for the faint of heart (or the light of wallet). Way more Jaces, including the 1UU and especially 3UU ones. Playset of Ashiok, Nightmare Weaver. Higher-mana planeswalkers, like Karn Liberated and Nicol Bolas, Planeswalker. Removal of green entirely, downgrade of red to a splash color. Enabling of a Liliana of the Dark Realms swamp-based strategy. Replacement of the Vivid/Reflecting Pool/Farseek/Duals manabase with a Duals/Fetchland/Signet one. It plays very differently from the previous list. It's a little more vulnerable to fast aggro decks, as it doesn't make as many tokens to block with, but once it gets established it can be pretty resilient. Try it out (if you are rich)! Sometimes you just have to spend hundreds of dollars on a casual deck. 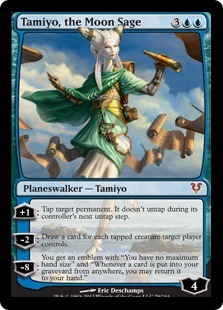 Most of what planeswalkers do has nothing to do with their ultimate, but every once in a while it happens. We spend the -8 (or whatever) and get some amazing splashy effect. So, ignoring all other parts of the card, what are the best ultimates out there? The combo possibilities are endless, and it's hard for your opponent to get through a free-buybacking counterspell. It does require a lot of setup to pull off, and your hand needs to be right. Raaaarrrgghh!! Stomp stomp stomp. By the time you use this, you should have at least 7 to 10 lands in play, which short of a Wrath will be near-impossible for your opponent to deal with. This in my opinion narrowly beats out Sarkhan Vol's five 4/4 flying dragons or Ajani, Caller of the Pride's indeterminate number of 2/2s. How can your opponent win when they don't have any stuff? This does remove less than other abilities we'll see later, however. It's only three, but Control Magic is quite a strong effect. I'd rather steal three things of my choice than kill all the creatures. In most games. It's slower than Sorin, but given enough time, it can do a whole lot more. Including killing artifacts, enchantments, or lands. It would be higher up the list if it were more immediate. This is one of those abilities which essentially reads "You win the game, unless you were REALLY far behind." And if you were playing with Good Jace, you were probably not doing too badly on the board. It's splashy, it's immediate, and it probably ends with you winning the game shortly after. Yaaaahhhh. If making an opponent sacrifice seven permanents sounded good, how about all of their permanents? Yours are gone, too, but you get to keep a Gideon—who can animate himself and start swinging the next turn! Your opponent is basically not coming back without a quick Swords to Plowshares and some miraculous topdecks. This is an even stronger version of Gideon. Instead of one vanilla creature to swing over an empty board, you get a whole ton of stuff! For your opponent to get out of THIS one, they basically need some crazy two- or three-turn combo deck. Congratulations, Karn! Hopefully this victory will help you recover from the psychological trauma you endured while looking at Beast of Burden. If you evaluate the ultimates thinking of what's the one that's most likely to end the game, Jace the Mind Sculptor is unbeatable. It's not unlikely to be an insta-win. 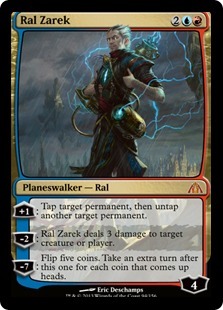 Ral Zarek's is meh to me, it's the one ultimate that has a chance to entirely fizzle (it's 1 chance out of 32 possible outcomes, so not likely but not even astronomically unlikely). Statistically it gives you 2.5 extra turns (10/32 outcomes for both 2 and 3). It's a good advantage, but so is killing half the permanents of the opponent. It wins you a game if you were already set to win the game. If your board was empty, or your creatures couldn't get through, it equals to casting Concentrate. And Karn goes up in loyalty by exiling cards from the opponent's hand. They'll usually be a bunch of non-permanents or lands. You can actively exile your own hand in order to restart the game with heavy stuff in play, but at that point you're giving up a board position where you have an active Karn on the board, which usually is enough to be ahead. I think the best (=scariest) ultimates are the ones that work in a vacuum, not depending on a particular game state. Elspeth, Knight-Errant definitely deserves to be in the top 10, if not the top 5. Unlike Avacyn, who can be exiled, the indestructible emblem cannot be removed which is really hard to deal with. From my experience I don't think I've ever lost once I got the emblem out, although I have seen a couple opponents who were just too far behind when they got theirs. For Ral Zarek, I got him to ultimate a couple times, and well.... 1 extra turn doesn't always do that much. Just too random. 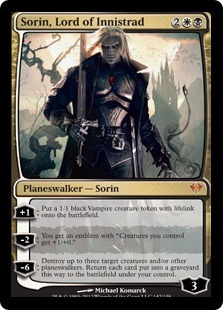 I had several opportunities in the past to ultimate Sorin, Lord of Innistrad, and never took them. There was just never enough good stuff out there for me to want to blow up versus getting another emblem. I think people avoided playing good stuff knowing he would be able to just steal them. Chandra's isn't as impressive as it should be, but that's just my opinion. This? this is my kind of crazy. Magnificent, Cotton. That deck seems.... excessive. While I get the spirit of the deck (Run every planeswalker evahh!!!) it's obviously not going to work well in practice. I'm guessing if you take out Tibalt, Nissa, Agent of Bolas, Caller of Beasts and Domri Rade it might just win a couple games though. And maybe replacing them with something like Chromatic Lantern, Prismatic Omen and Coalition Relic.